This pleasant apartment is located on the border between the San Polo district and that of Santa Croce and is just a short walk from the famous Rialto Bridge, with its stupendous colourful fish, fruit and vegetable market. Just a short distance from the Basilica dei Frari and the Accademia area connected to San Marco by a bridge carrying the same name. 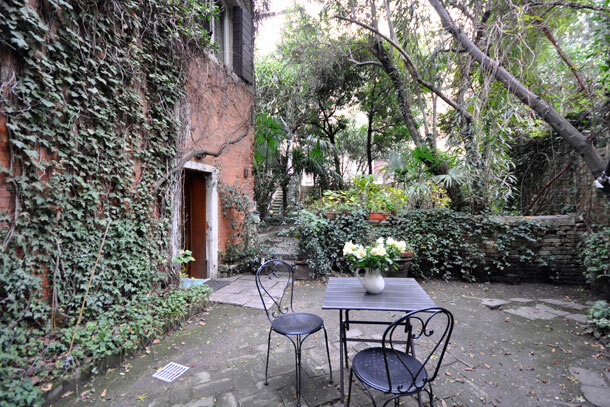 The apartment is situated inside a peaceful alley that opens up to a typical courtyard called `corte del teatro`, located on the ground floor and with two entrances: the first leads directly to the inside the apartment, the other entrance has a nice small private garden equipped with table, chairs, deck chair and sun umbrella for enjoying relaxing moments during your stay. The garden is of exclusive use of the guests. The apartment has been recently renovated and furnished with care and taste, good equipment. GROUND FLOOR: entrance, living-room with double sofa bed and TV and mini-kitchen corner with two electric hobs, kitchen/dining-room with oven and freezer, 1 double bedroom with TV, 1 twin bedroom with beds that can be put together, 1 bathroom with bathtub, 1 bathroom with shower. From the living-room you can directly access the private equipped garden. Paid on site in cash: Extra mandatory expenses: late arrival, for arrivals after 7.30 pm until 11.30 pm: € 30 extra; for arrivals after 11.30 pm: € 40.